With summer here and the temperatures on the rise, it’s always a good idea to occasionally head inside for a rest from the heat. If web surfing and Netflix binge-watching are getting a little boring for you, check out some of these popular online courses that can cure some of the summer doldrums while keeping your skills sharp. As always, Lynda.com is free for students, faculty, and staff! R is one of the industry-standard programming languages that specialize in data analytics and reporting. It’s also free to use! 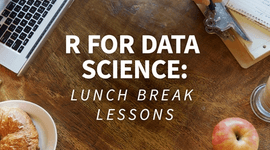 In these bite-sized videos, you will be introduced to concepts in R that you can learn and practice during your lunch breaks. Review language basics, discover methods to improve existing R code, explore new and exciting features, and learn about useful development tools and libraries that will make your time programming with R that much more productive. Start now! 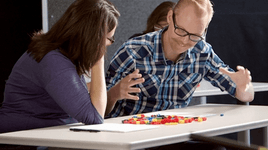 One of the most popular Lynda courses at SMU, Project Management Foundations, doesn’t just provide a start-to-finish approach to getting things done and making projects more successful. It also offers professional development units (PDUs) for those who are certified with the Project Management Institute. If you are interested in honing your project skills, get started here. The Linux operating system is becoming more and more common in many academic disciplines. While many Linux distributions have graphical environments like Windows, knowing the basics of the Linux command line can make working with the system quicker and easier. In this course, Scott Simpson discusses some of the common tools, such as grep, awk, and sed, and command-line apps such as the nano and Vim text editors. The course wraps up with a look at how to install and update software via the Linux command line. Click here to begin. In this fun and interactive course, discover how creativity isn’t necessarily a given trait; it’s a skill to be learned! You’ll explore some common misconceptions about creativity, learn the hidden value of the “stupid idea,” and, through the course of the exercises, discover the three boot camp commands for energizing your creative process. Check it out here. And there’s more where those came from at smu.edu/lynda! Courses are added and updated daily, so check back often for the newest content.